Feeling secure on Facebook? 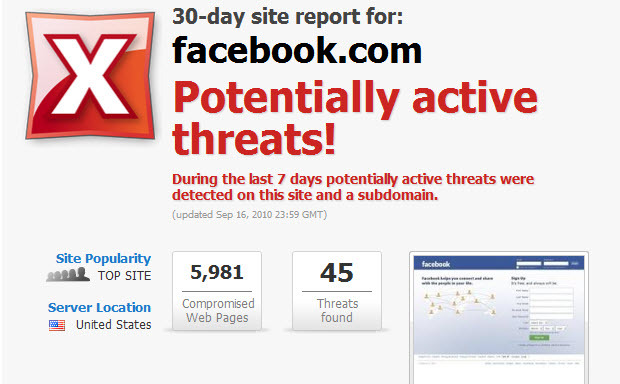 Well a recent report from AVG warns users against social networking sites and the potential for pages that compromise security and "friends" who may status jack your reputation. Given the popularity of social networking means it is hardly surprising that AVG's research shows that the top 50 social networking sites have 20,000 compromised pages containing web threats that could harm your computer or lead to your personal data. Through their research of social networking sites, AVG found 20,000 compromised pages in all, 11,701 of which are on Facebook. YouTube tallied 7,163 compromised pages. Similarly, in July 2010 the VeriSign Online Fraud Barometer looked at the Australian online fraud landscape and noticed those most affected by online ID fraud were 18–24 year olds with victims suffered average losses of $1,619 in the previous twelve months and one in ten expect never to recover their lost money. There are two important steps to take to protect your social media accounts. First, never leave your laptop unprotected. When you are in a semi-private area, such as a shared space like a college campus dorm room, make sure you lock your screen before leaving your seat. Second, create a strong password and don't share it! It’s important not to err from the side of caution, especially when dealing with Facebook pages and applications. A recent Communications Market Report found that just 15% of 16 - 24 year olds were concerned about Internet security and even fewer (just 9%) were concerned about Internet privacy. Everybody, but especially this age group, needs to watch who you give permissions to. Being safe on the Internet is easily manageable as long as you use some simple common sense.